Wendy Lamb Books, 9780385327756, 240pp. When Russell's dog, Rodney Rodent, jumps into a mural to chase a demonic-looking gnome and disappears, the Flint Future Detectives are on the case. With the secret password (Bow-wow-wow yippee yo yippee yay!) Steven, Richelle, and Russell enter the mural too, only to find the mysterious Mr. Chickee on the other side. To find a way out, the detectives must complete a mission—finding Rodney Rodent. And that means they're in some wild adventure! Christopher Paul Curtis is the bestselling author of "Bud, Not Buddy," winner of the Newbery Medal and the Coretta Scott King Medal, among many other honors. His first novel, "The Watsons Go to Birmingham--1963," was also singled out for many awards, among them a Newbery Honor and a Coretta Scott King Honor. 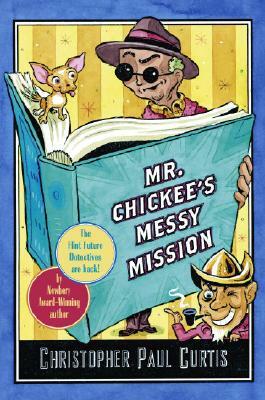 He is also the author of "Bucking the Sarge," winner of the Golden Kite Award, and "Mr. Chickee's Funny Money." He and his wife, Kay, have two children and live in Ontario, Canada.